Hello and welcome to Milwaukee! My name is Kirstin, and this is my hometown. I grew up out in the suburbs, and then left for awhile during college, grad school, and my first job. 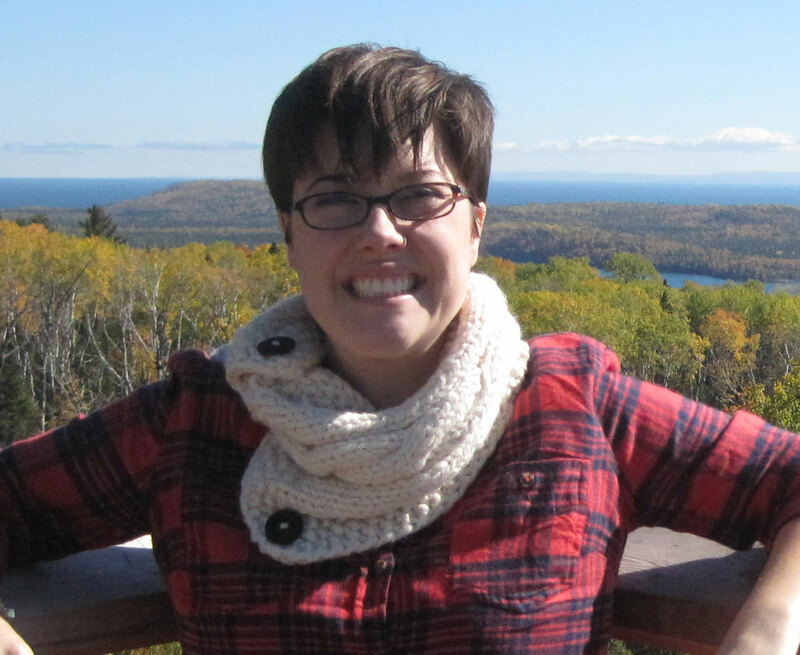 I moved back to the city in August 2011 when I accepted a job as an Assistant Director of Student Involvement at the University of Wisconsin-Milwaukee. I have discovered that running has been one of the best ways to get to know the city. Well, that and eating. I am probably better at eating. I have to start with a few confessions. First, that I am relatively new to running. I picked it up back last January with the goal to complete a half marathon before turning 30 (which happens this February), and then for some reason signed up for the full Lakefront Marathon. Is it crazy to immediately train for a marathon? Probably. But that was my goal. Running and participating in marathon training is something that was totally out of my comfort zone. I certainly felt vulnerable being constantly last in the pack in the group training runs. But I stuck with it most of the way, getting up to the 16-mile run. Unfortunately, I ended up getting injured during the training process and had to put my goal on hold. As challenging as it was, I really loved the milestones that I accomplished with training. I went from a Couch to 5K plan, to running a 10K and a ten-mile race. Each new distance become the longest I had ever run. Completing a marathon is still a goal, but I may just try a half-marathon first. My second confession is that I actually completed this run back in July. You might notice that the weather looks a little different than it does today. It is currently snowing as I write this post. I also had a ponytail back then, while I am currently sporting a pixie cut. 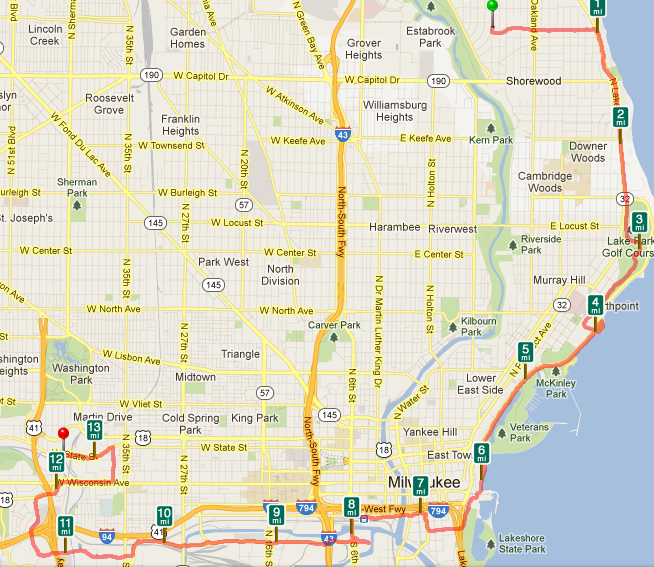 As a newbie, I thought it might be easier to fit it my run of Milwaukee with my marathon-training schedule. It actually worked out perfectly with a week that I had to miss a group long run. I completed this with my colleague, Becca. She is basically my unofficial running guru. She is a serious runner who has completed several marathons and an Iron Man. She’s my go-to person for those random questions like, “which socks should I get,” “should my feet look like this,” etc. It should be noted that while I ran 13.3 miles this day, Becca ran five miles prior to the start of our run. Total inspiration! One of the absolute best things about Milwaukee is living by Lake Michigan. I am only about a mile away, and enjoy all that the lake has to offer. Initially, we were going to drive down and meet near the beach, but instead we started our run by heading down Lake Drive where all the fancy houses are, and through Lake Park. A theme for our run was free-styling it. We ended up doing a few trail runs along the way, not necessarily on purpose. 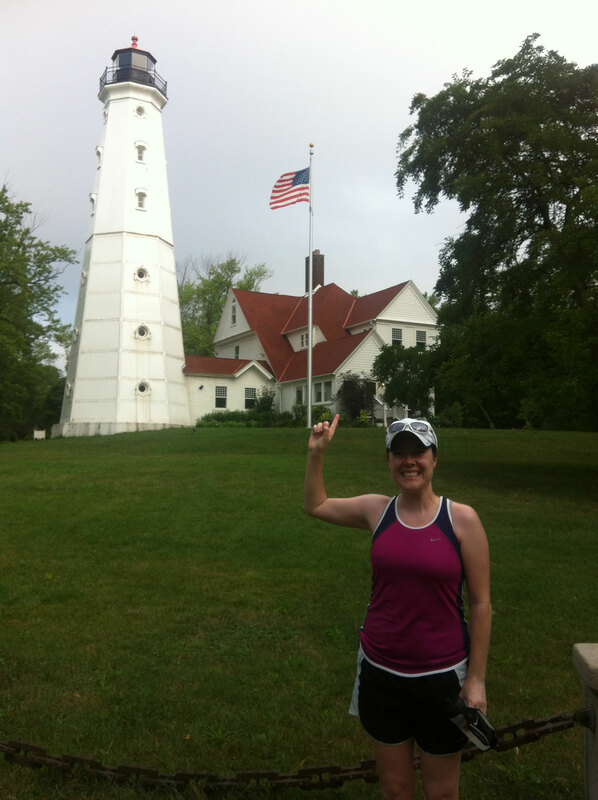 Check out the North Point Light House. It is one of my favorite things in Lake Park, which has great running trails. Our marathon training runs started and ended here each week. You can actually go up in the lighthouse and look out of the tower for quite possibly the best view of both the city and Lake Michigan. Definitely worth the trip. Since this was an unplanned stop, I didn’t have a sign or a thank you for here. My first thank you here goes to Becca. Both for tagging along with me on this run, and more importantly, for being an excellent motivator and keeping me positive throughout my training experience. And for being the first to tell me it was okay to stop when I just couldn’t do the marathon training any more. Thank you Becca! 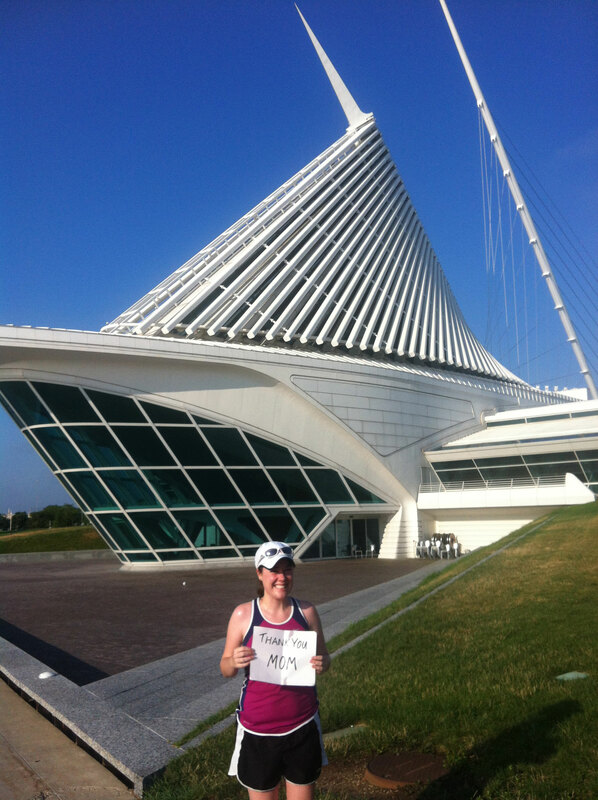 From there, we ran down the lakefront path to stop #3 at the Milwaukee Art Museum. Does it look familiar? Our beautiful museum was featured in Transformers 3, although sadly was not a transformer itself in the movie. In real life, it does transform a bit. See how the top looks like a bird? It is engineered so that based on the wind each day, the wings will swing out. If you love art, they have a pretty decent collection, and a fantastic gift shop. Here I would like to thank my mom. She is an all-around rock star, and a totally inspirational woman. I don’t think I tell her that nearly enough. I appreciate all of the opportunities that she gave to my sister and I growing up, especially our appreciation for the arts. Thank you Mom! 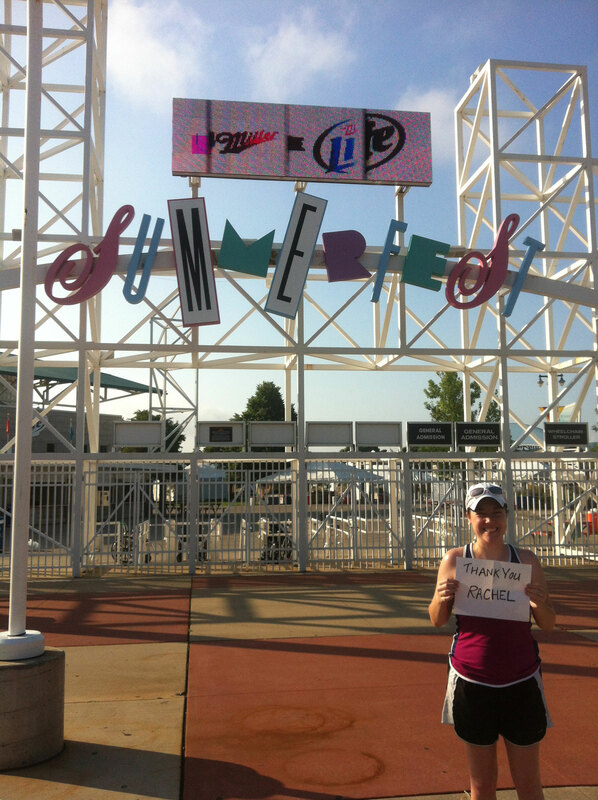 Practically right next door, we made our next stop – The Summerfest Grounds! Actual name: Henry Maier Festival Park. If you didn’t know, Milwaukee is known as the festival city, because we have tons of festivals throughout the summer, most of them right here. The biggest one to take place on the grounds is Summerfest, a 10-day festival of music. In my opinion, the best week of the summer. Fellow runners will also appreciate that we found one of the cleanest porta-potties in the city here. I learned a lot about just how important those are during my training. At this stop, I would like to thank my sister, Rachel. Rachel and I didn’t get along much when we were growing up, but she is my best friend now. I am also very proud to call her a colleague. This girl is one of the best student affairs professionals and social justice advocates that I know! I thought this would be an appropriate stop to thank Rachel because she and I share a love of music. I can remember a few years where she was at Summerfest almost every day. Thank you Rachel! From here, we cut through to The Third Ward, a great location for restaurants, bars, and cute little shops. 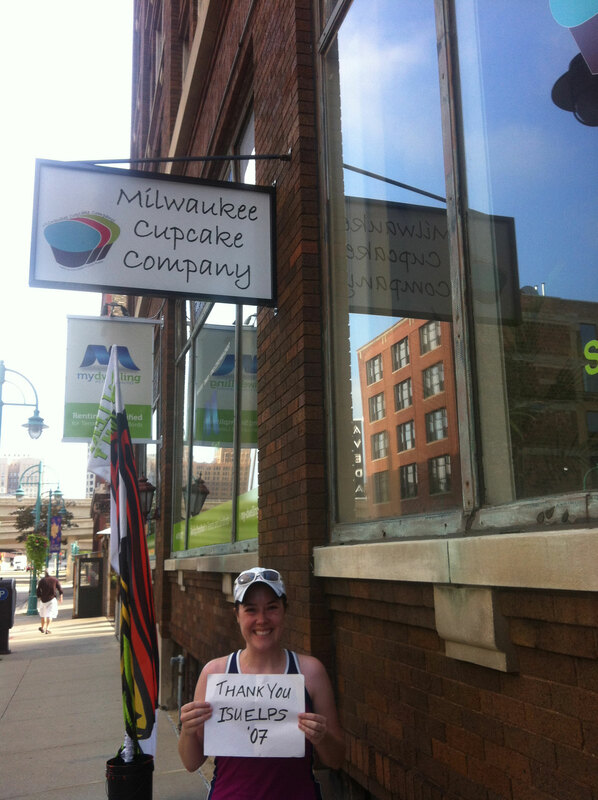 I couldn’t do this without making a stop at the Milwaukee Cupcake Company. I have a small obsession with cupcakes. If it was open, I totally would have paused for one. Other great things to check out in the area include Smoke Shack, a BBQ restaurant just down the block, and the Milwaukee Public Market, an awesome marketplace with a variety of vendors. So many great destinations! Here I would love to thank my colleagues from my graduate school cohort – the ELPS 2007 crew from Iowa State University. They will appreciate that I tagged them at a stop about food. But really I couldn’t have gotten through graduate school, or life, without them. Thank you friends! This is where our run got really fun. We cut down St. Paul and over on 6th Street to head to the Harley Davidson Museum. If you didn’t know, Harley Davidson’s headquarters are in Milwaukee. Even those who may never ride a Harley have pride in this local company. I have never been in the museum, but it is supposed to be really cool, and to have a great restaurant. 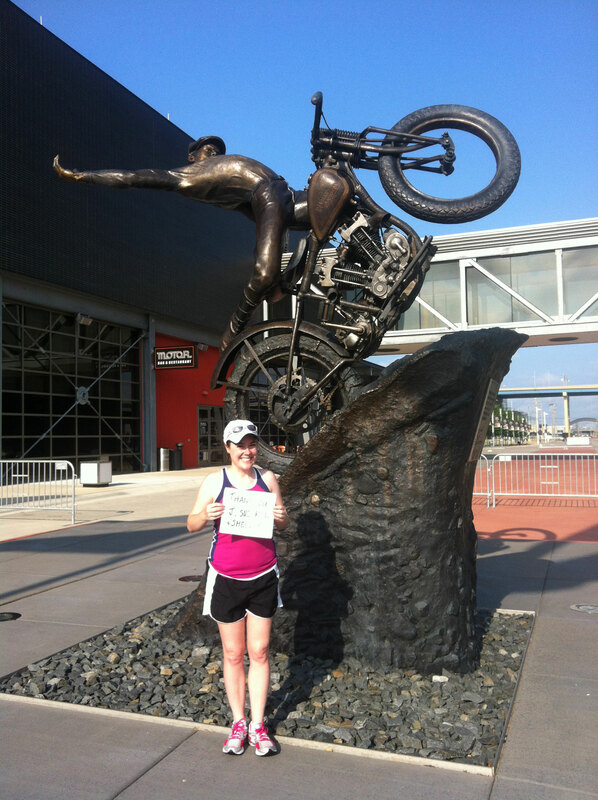 We did take the opportunity to take some great pictures with bike statues out front. Although it’s hard to read my sign (sorry! 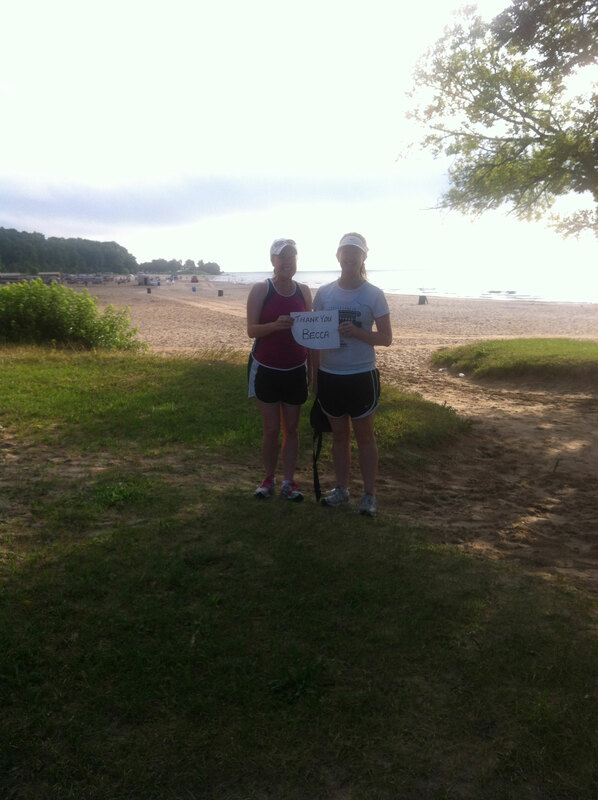 ), this is the stop where I would like to thank Janelle and Susan. The three of us worked together at Saint Louis University for four years, and while there, they convinced me to enroll in the PhD program with them. Although reluctant, I agreed. They both now have the title of Dr., and continue to provide me inspiration and encouragement to work on that dissertation everyday so that I can join them in the next year or so. Thank you Janelle and Susan! As we continued along down the long stretch that is Canal Street, this is where we had to do a little bushwacking and go off the beaten path. If you look at my map, please know there are probably more direct routes to our next stop, Miller Park! 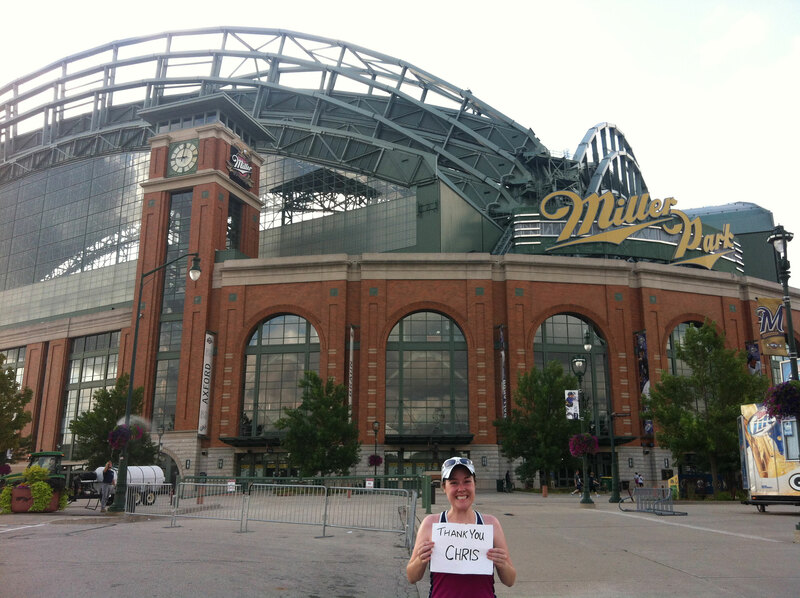 There was no way that I could leave out our gorgeous ballpark, home to the Milwaukee Brewers! Miller Park is known for its great tailgating before games, and the famous running sausages, of course. I had the chance to do the stadium tour this summer, and highly recommend it, if you happen to be in town on a day where there isn’t a game. But you are always welcome to come route for the home team! 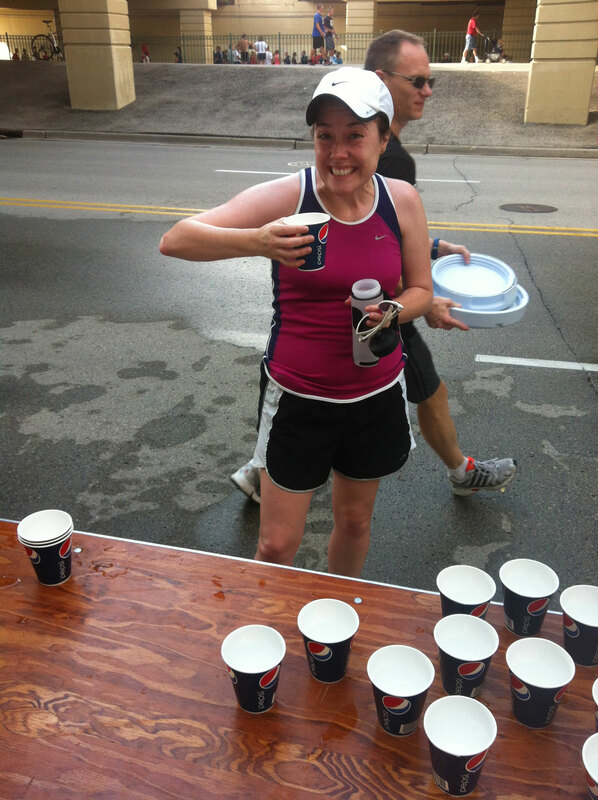 While we were at Miller Park, they just so happened to be hosting a 5K, and the volunteers were nice enough to let us have some of the water before they dumped it. I have never been quite so happy for a surprise water stop. Another quality porta potty experience here as well, folks. They are very diligent about keeping them clean. Here I have to thank Chris, my wonderful significant other, who moved to Milwaukee with me last August. We have greatly enjoyed exploring the city together, although I can safely that my training runs certainly put a damper on his fun this summer. He is a huge baseball fan, and we missed a lot of games. I cannot thank him enough for being patient with me through many Saturdays that involved lots of ice packs and whining through the pain. I owe him a million more thanks, but here is one public one. Thank you Chris! Becca and I left Miller Park and headed on down the road to our final stop, Miller Brewery. This is another point where you might be able to find a more direct route that what my map shows – don’t try to cut through the tailgating lot like we did. There are probably routes that feel slightly more safe – I wouldn’t run this path at night. 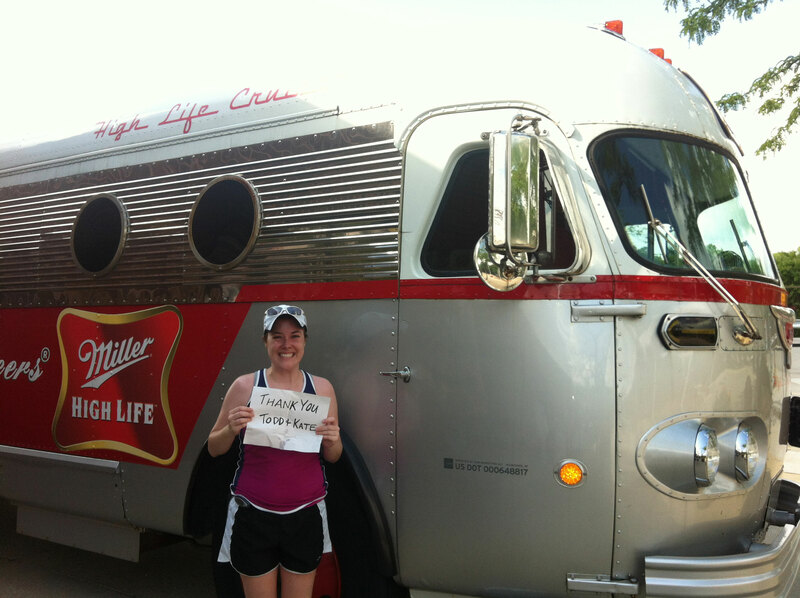 But, it was worth making it to the Brewery, especially since the High Life Cruiser was out front! I moved to Milwaukee from St. Louis, another major brewing city. I definitely think a good brewery tour is always a fun stop. We have a bunch here in town, but this one is definitely a classic. Sadly we were a little too smelly to participate on this day. There was no one more appropriate to thank here, than my friends/colleagues, Todd and Kate. Todd and Kate were actually the people who inspired me to start running. They trained for the Chicago Marathon a few years ago, and inspired me to try my own endurance run. Even though they didn’t know it, they are the voice in the back of my head telling me to keep going. And they love a good brewery tour! Thank you Todd and Kate! Finally, I want to share the donations that I will be making. I think that was one of my favorite parts of this project. First, I’ll be donating to Milwaukee Pets Alive. This awesome non-profit started just this year, with the goal of finding homes for homeless pets in the Milwaukee area. It is a truly amazing organization that saves lives every day. I will also be making a contribution to the Alpha Phi Foundation, an organization that has made a huge impact in my life and my work as a fraternity and sorority advisors And finally I will contribute to the American Cancer Society in support of UWM’s first Relay for Life this year. Cancer has had a profound impact on my family, and although my contribution is small, it is made with the belief that we will find a cure and that everyone will be able to enjoy more birthdays. This was an awesome experience. Thanks so much to Steve for letting me participate! Send a note my way if you are ever in Milwaukee! And feel free to keep up with my other adventures (both running and eating) at my personal blog. Keep it up! I’ll surely be back again very soon!